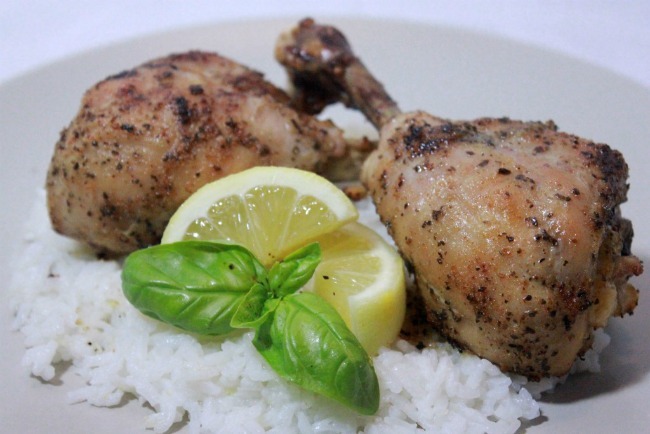 There is nothing quite like chicken drumsticks for lunch! The good news is, we will have our own kitchen and much more time to cook because we will be much closer to work. So, more simply delicious recipes like this one are sure to come. I really like this one in particular because dark meat chicken is my favorite but I don’t grill. Mostly because I haven’t practiced and I don’t have a very nice grill…but also because grilling is for boys and I’m a girl. So I bake my chicken and it is fabulous. The most important thing with chicken is to be sure not to over cook it. As long as it is at, or above 165ºF, it is perfectly safe. It is most juicy right around that temperature so don’t kill the drumsticks, they’re already dead. If you can get that down, you won’t be disappointed. This is a perfectly wonderful dish to share with the family and I hope you enjoy it! Mix Cayenne, salt, onion powder, garlic powder, cumin, dried basil and black pepper in a small bowl. Remove the skin from the chicken drumsticks. Place on a baking rack with a rimmed sheet pan underneath, and brush on spices evenly. While chicken is baking, prepare the seasoned butter. Melt the butter in a small pot over very low heat to prevent burning. Once the butter is completely melted, add the garlic, ginger and lemon. Allow the concoction to simmer for about 15-20 minutes while the chicken bakes. If you have a wire mesh strainer, you can strain the butter when the chicken is almost ready to come out of the oven. This will remove the solids in the butter mixture. It isn’t required and the dish will still be very tasty if you skip this step, but it adds to your final presentation and makes the butter much easier to work with. Remove the chicken from the oven once the chicken is at the appropriate temperature. With a basting brush, apply the seasoned butter to both sides of the drumsticks. Once the oven reaches the appropriate temperature, place chicken in oven for 2 minutes. 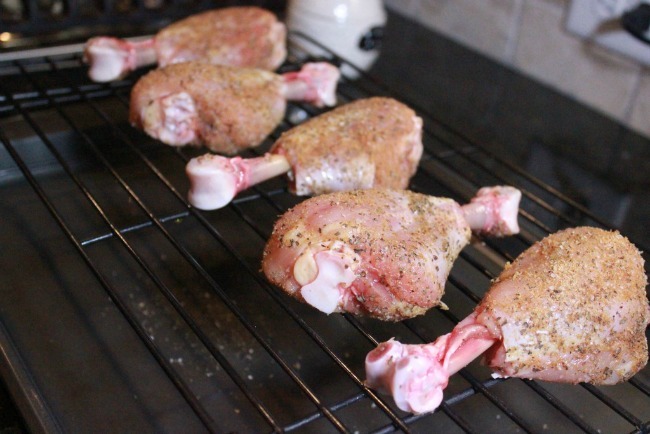 Flip the drumsticks and broil for another two minutes. Remove chicken from oven and insert meat thermometer at the thickest point in the drumstick to be sure it reads at least 165ºF. If it has not yet reached this temperature, simply place the chicken back in the oven to broil for another 2 minutes. 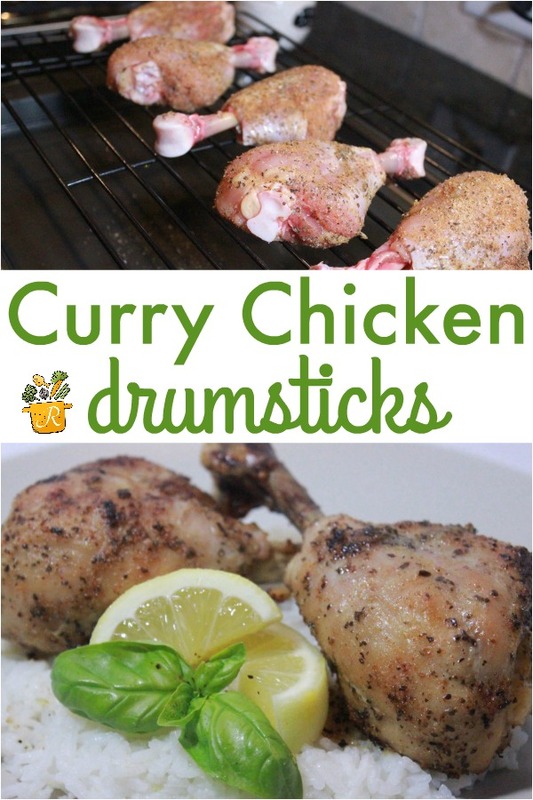 Let the drumsticks cool for about 5 minutes and serve with a side of your choice. Enjoy! Because I’m half Peruvian and eating rice is what I do, I obviously served this with rice. I added about 1 tsp of grated ginger, zest from half a lemon, 1 tsp of salt and about 3 fresh, chopped basil leaves to 2 cups of rice and 4 cups of water. It ended up being a great compliment to the chicken. Give it a try!